Just like the collection of basic type, a collection of embeddable class can be persisted by using @ElementCollection on the collection reference in the entity class. The corresponding class of the collection elements, must have @Embeddable annotation. 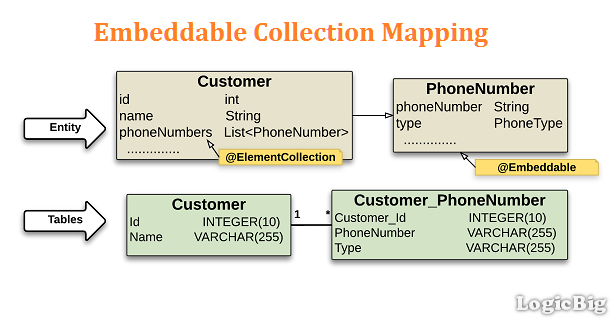 The Entity and the embeddable collection are mapped to two separate foreign/primary-key tables. One for the entity and other for embeddable fields/properties values. The collection table has the foreign key pointing to the primary key of the entity. This is similar to OneToMany, except the target is an embeddable class instead of another entity. By default, JPA specific naming conventions are used for the mapping. To customized that, we can use @CollectionTable annotation along with @ElementCollection. Note that all cases of @Embeddable class are applied here: we can use an embeddable class within another one, the embeddable can have entity relationship and/or we can also use multiple instances of same embeddable type collection in our entity.